The Lady Clara flower Swarovski earrings feature flowers made of Swarovski white pearls on twisted beaded stems and are surrounded with crystal beads which adorn a beautiful bride on her wedding day. 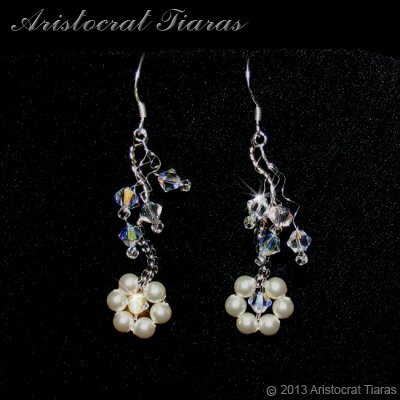 These crystal earrings from Aristocrat Tiaras emphasis the beauty of nature and are designed to match the Lady Petunia flower necklace and to compliment our bridal tiaras such as Princess Aurora tiara. They are recommended to wear a hair stlye that is away from the earrings to avoid hair being caught in the fine twisted stems.